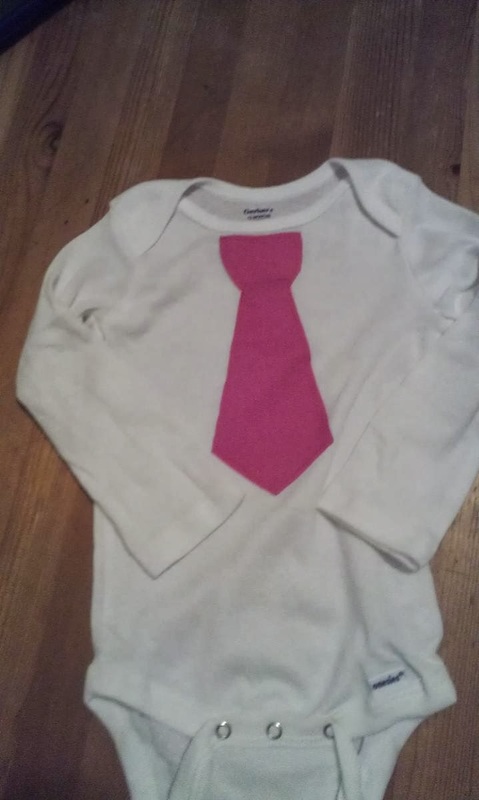 I tried something new lately and made tie onesies! They are so adorable! My friend A showed me the tutorial from crapi'vemade. P.S. I love that blog name. I think it's hilarious. My onesies didn't turn out perfectly, but it's the thought that counts, right? So, I can't figure out how to get two pictures on the same line. Here are my two oneises I have made so far, and I love them! Like I said, they aren't perfect. If you want to try making one for yourself go here somewhere. I couldn't find the exact link, but it's on her website somewhere. She has a template and easy to follow instructions. I made the pink one for my friend B, who is expecting a her first baby boy next spring, and the "hunting" type one for my friend L, who just had her second boy! I wish I'd made these for my kids...oh well. If anyone else would like one of these, I would love to make you one! They are a cinch! However, I don't have the money to keep buying onesies! So, if you'd like to send me money for a onesie, or just send me a onesie, I will make you one and mail it back to you! (and any special fabric, that you want for the tie.) Just contact me on facebook messages. See you later! p.s. I hate that snails and puppy dog tails poem. I think it's dumb. Love the onsie you made for me! It's going to fit my little chunker much sooner than I expected! I'll definitely send you a picture when it does. Thanks again! You are so sweet! !